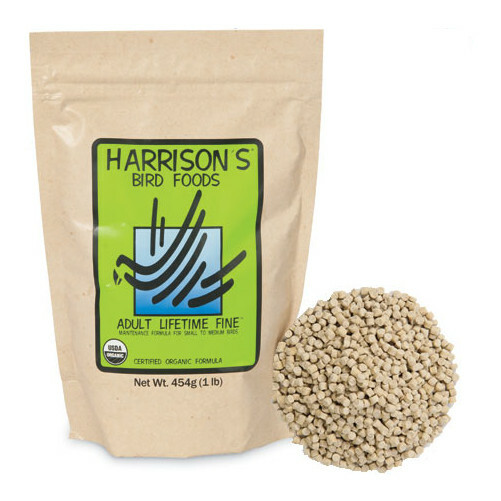 Harrison's Adult Lifetime Fine is a high potency, dietary food, suitable for regular feeding to most non-breeding medium-sized birds including lovebirds, doves and pigeons. Contains wholly natural, palatable ingredients, guaranteed to improve your bird's vitality. *Ground Yellow Corn, *Ground Hull-less Barley, *Hulled Grey Millet, *Ground Soybeans, *Ground Shelled Peanuts, *Ground Shelled Sunflower Seeds, *Ground Lentils, *Ground Green Peas, *Ground Toasted Oat Groats, *Ground Alfalfa, *Ground Rice, *Chia Seed, Calcium Carbonate, Montmorillonite Clay, Vitamin E Supplement, Ground Dried Sea Kelp, Sea Salt, *Sunflower Oil, Natural Mixed Tocopherols, Lecithin, Rosemary Extract, *Algae Meal, Vitamin A Supplement, Vitamin D3 Supplement, Dl-Alpha Tocopheryl Acetate, Vitamin B12 Supplement, Riboflavin Supplement, D-Calcium Pantothenate, Niacin Supplement, Pyridoxine Hydrochloride, D-Biotin, Thiamine Mononitrate, Folic Acid, Zinc Sulfate, Manganese Sulfate, Copper Sulfate, Sodium Selenite, Calcium Carbonate, *Vegetable Oil. Make sure to feed fresh food daily, do not "top off". To help reduce waste, feed as distinct meals. Birds may eat all they want, but use the table below as a guideline. Below are some recent questions we've received regarding Harrison's Adult Lifetime Fine Bird Food, including answers from our team. Can I feed a Turaco this product? Feeding a Turaco with the best I can? This food is suitable for most small/medium breeds of birds including pigeons, cockatoos and love birds, and is a great diet to keep your bird(s) on throughout their lives. The Turaco is an omnivore so this food alone is not enough to mimic the diet your Turaco would normally have in the wild. Boiled eggs, dried insects, mince meat and crickets can be given alongside this food, as well as fresh or dried fruits and veg to keep your bird(s) happy and healthy. I hope this can be of some help to you, but if you require any further assistance please let us know. I am confused because I like LAFEBER and Harrison. BUT LAFEBER has nutri berries with fruit and veg. Harrison adult lifetime course are just plain and simple. Which one should I buy for my cockatail?? I want to buy the best pellet food. LAFEBER Is expensive. Harrison I's said to have some patability problems in some birds. Ufff. Help plz!!! We would recommend Harrison, it is one of our top sellers and our customers enjoy it. I have ordered the super fine high potency feed for my 10 week old budgie, is that suitable for a lifelong diet or will I need to order this variety? I wasn't sure if this was too coarse for a Budgerigar. Thank you. The High Potency Fine or Superfine are best for the first 8 months or so of life. After that, the Adult Lifetime is ideal. You can choose between Fine or Superfine, both can be eaten by budgies and it is not important which.